SANTIAGO, Apr 19, 2010 (Tierramérica) - The success of the climate change conference taking place in the central Bolivian city of Cochabamba will depend on how unified civil society ultimately is in its efforts to influence the United Nations climate summit, in Mexico, say Latin American activists. The World People’s Conference on Climate Change and the Rights of Mother Earth, Apr. 19-22, convened by Bolivia's President Evo Morales, has brought together some 12,000 people from 130 countries, including international personalities, representatives from citizen groups and government officials. The bulk of the debate will be led by civil society, which tends to oppose the market-based mechanisms proposed by most of the governments to fight climate change, and this is fuelling doubts about just how much impact the Bolivian forum will have on the official climate talks taking place within the United Nations. Only presidents who are personally close to Morales are attending the Cochabamba conference, such as Rafael Correa of Ecuador, Fernando Lugo of Paraguay, Daniel Ortega of Nicaragua, and Hugo Chávez of Venezuela. Other governments, like those of Brazil and Chile, will not participate. "I think it's a very important space for coming together, where it will be possible to discuss and come to agreement on our positions and strategies, but that depends on the organisations that participate," Colombian Lydia Fernanda Forero, member of the council of the Hemispheric Social Alliance, told Tierramérica. The Alliance, an umbrella of grassroots organisations and networks from Canada to Chile, will have a greater presence in Cochabamba than it did at Klimaforum 2009, the civil society summit held in December in parallel to the 15th Conference of Parties (COP 15) to the UN Framework Convention on Climate Change. "Thanks to (President) Morales we have a rainbow of social and political entities behind this issue that we couldn't have even dreamed of four months ago," including student and labour groups, said Eduardo Giesen, the Latin America coordinator of Friends of the Earth International's climate justice programme. For Alejandro Yianello, of Argentina's Piuké Ecologist Association, "it's an advance that there are other actors discussing the issue " besides those associated with COP 15. He told Tierramérica that he applauds the Cochabamba conference's shift of the focus towards "the rights of Mother Earth." Massioli, of the Brazilian Movement of Landless Rural Workers (MST - Movimento dos Trabalhadores Rurais Sem Terra) and of Vía Campesina International, said in an interview with Tierramérica that the conference will not be a "trade fair" but rather "an important space for information, reflection, dialogue and coordination among peoples." The conference's 17 working groups will deal with issues like the structural causes of global warming and the Bolivian proposal to create an international tribunal for climate justice and convene a climate referendum of the peoples of the world. Also up for discussion is the situation of indigenous peoples and of "climate migrants," and possible solutions for financing the transfer of technologies necessary for communities to adapt to the effects of climate change. "Morales's call synthesises what many social movements in Latin America have been proposing in a fragmented way," which poses a big challenge to the organisations, said Lucio Cuenca, director of the Latin American Observatory of Environmental Conflicts, in Chile. Mexico, which will host the COP 16 in December - an effort to reverse the failure of the Copenhagen meet -, is represented in Cochabamba by delegates from at least seven environmental groups. "Our general proposal is to say 'no' to the false solutions against climate change offered by nearly all governments, such as market mechanisms that do not have mitigating effects," Miguel Valencia, an organiser of Klimaforum 2009, told Tierramérica. 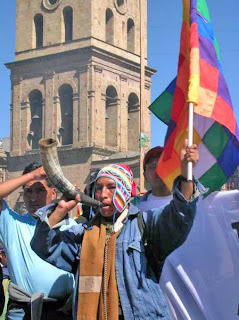 "Cochabamba can be a democratic space for developing organisational capacity to build accord within civil society," said Claudia Gómez, of the non-governmental Mexican Centre for Environmental Law. But not everyone sees this forum as an opportunity to strengthen civil society's role in the climate change debate. The non-governmental Wildlife (Vida Silvestre) Foundation, which last month in Argentina led the campaign to turn out the lights to fight climate change, will not participate in the conference "due to budget issues" and because "it is more a meeting for indigenous organisations," said foundation member María José Pachá. "It's not a UN meeting," she said. Hernán Giardini, delegate from Greenpeace Argentina, is participating in the Bolivia meet, but told Tierramérica that he hopes it doesn't turn into an alternative process to that of the UN. It is the United Nations where decisions are made, he said. In contrast, the director of the non-governmental Sustainable Chile Programme, Sara Larraín, believes the Cochabamba conference represents precisely the possibility of recuperating "international democratic governability," given the failure of the official talks. "We believe the people's conference is a fundamental space because if a pole of subversion and response is not created, and if we don't take the floor from the governments, there is no possibility that the negotiations will advance," Larraín stated to Tierramérica. "We are going with the expectation of the creation of a genuine social and popular movement that takes up the environmental questions - in this case the climate crisis - as a social and socio-political problem, and that it is constituted beyond the non-governmental environmental organisations," said Friends of the Earth's Giesen.